How would you like to become Lily Allen on Christmas Day? John Lewis Retail, which operates 40 John Lewis stores across the UK, is running a YouTube competition – called ‘ReWorked’ – which will give one aspiring artist a chance to take Lily Allen’s place in a special TV advert to be aired nationwide in the UK on Christmas Day. John Lewis’s popular 2013 Christmas TV advert features the animated story of best friends Bear and Hare at Christmas, set to Lily Allen’s cover of Keane’s 2004 hit, ‘Somewhere Only We Know’. All you have to do to take part in the ‘ReWorked’ competition is to upload a video of your version of ‘Somewhere Only We Know’ at www.youtube.com/JohnLewisRetail. The competition closes on December 3, 2013 and a winner will be chosen by December 6, 2013 by a panel that includes a member of Keane. If you win, you’ll be given an all-expenses paid trip to London where you will record the track in a professional studio with producer Paul Beard (who also produced Lily Allen’s ‘Somewhere Only We Know’ cover). Your recording will then provide the soundtrack for a special 90-second version of the advert which will be shown live on ITV1 on Christmas Day. “How [Not] To Write A Hit Song! – 101 Common Mistakes To Avoid If You Want Songwriting Success” is available from Amazon as a paperback, or as an eBook from Amazon’s Kindle Store, Apple’s iTunes Store (Books/Arts & Entertainment/Music) and Barnes & Noble’s Nook store. Read a FREE sample of the book HERE (USA), HERE (UK) or HERE (Australia). With a 5-star rating at Amazon, this book takes a close look at the essential elements that are consistently found in the structure, melodies and lyrics of all hit songs. It highlights the most common errors that are made when these key components are built into a song, so that new writers can try to avoid such mistakes in their own songs. Most writers have had to endure the disappointment of having their songs rejected, and ended up asking: “Could I have done more to make my songs better?”. “How [Not] To Write A Hit Song!” aims to help writers recognize weaknesses in their songs, so they can re-work them, make them stronger, and hopefully achieve the breakthrough they’re striving for. 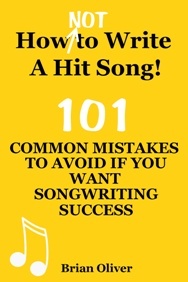 The book includes a detailed checklist of 101 common mistakes that writers can measure their own songs against. The 40 most common lyric writing mistakes are exposed in this new book by experienced music publisher and music consultant Brian Oliver. Written in an easy, non-technical style, the book identifies the most frequent causes of lyric writing problems and aims to help aspiring songwriters steer clear of the many traps that they can easily fall into when writing lyrics for their songs. “How [Not] To Write Great Lyrics!” gives new writers a wide range of valuable advice - from how to prevent common errors in the basic construction of their song lyrics ... through to the perils of making bad choices when it comes to titles, opening lines, lyrical hooks, verb selection, clichés, rhyming patterns, and many other issues. The book includes a comprehensive checklist of more than 100 potential hazards that writers can measure their own lyrics against. With more new songs being written than ever before, songwriters are finding it harder to sound original and craft rhymes that have not already been used. “SURPRISING RHYMING” is a new kind of rhyming dictionary that aims to make it easier for writers to avoid clichés and create rhymes people may not have heard before. Based on an in-depth study of the ingenious rhymes used by some of the world’s greatest songwriters and lyricists, this book offers an astonishing array of thousands of alternative rhyme options. It contains rhyme types much broader than those found in traditional rhyming dictionaries which tend to stick to ‘perfect’ rhymes. Instead, it focuses on ‘imperfect’ rhymes that are less predictable than ‘pure’ rhymes—and are therefore more likely to surprise an audience. The book also includes many new words that have been added to standard dictionaries in recent years. With 624 pages, the book is laid out clearly to make it quick and easy to find the perfect word to achieve a memorable rhyme. There are separate sections for one-, two- and three-syllable rhymes, along with many useful tips on rhyming. “SURPRISING RHYMING” is available from Amazon as a paperback and an eBook. It’s also available as an eBook from Apple’s iTunes Store, Barnes & Noble and Rakuten’s KoboBooks.